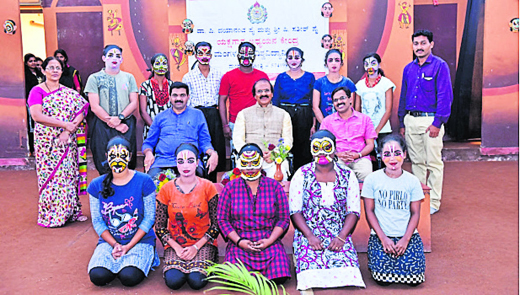 Mangaluru, Jan 28, 2018: Speaking after inaugurating “Yaksha Varna Vinyasa”, a one-day workshop on Yakshagana Bannagarike organised by the Mangalore University Dr P Dayananda Pai and Sathish Pai Yakshagana Study Centre here, Mangalore University vice chancellor Prof K Byrappa said, “Yakshagana is an art form that is deep-rooted in the soil of coastal districts and is thriving even to this day owing to efforts of connoisseurs of Yakshagana,”. In Yakshagana, an artist himself does the facial makeup, unlike in play and cinema. The Mangalore University has been giving emphasis to sports, art and theatre. Yakshagana artiste and lecturer Sadashiva Shetty said a Yakshagana artist should have knowledge of Bannagarike, dance, expression, costume design. The facial make-up of an artist varies from character to character in Yakshagana. The students of Yaksh mangala team participated in the workshop. They were trained in self-application of facial make-up among other things. Yakshagana Study Centre honorary director Prof K Chinnappa Gowda distributed certificates to the participating students. Mangalore University on the 69th Republic Day at Mangalagangothri held a photography exhibition. Speaking on the occasion, Lt Gen (retd) C R Sampath Kumar said, “On the occasion of Republic day, it is our moral duty to remember and pay tribute to all our freedom fighters who scarified their lives for the freedom struggle. India is a country with a rich heritage, culture, talents and natural resources. One should feel proud to be an Indian. Every citizen has a role to play for the development of the nation. Only criticism does not offer solutions. Unity is strength. But that unity should be for the welfare of the society and progress of the nation. Inciting violence will pave the way for problems,” he said. Mangalore University Vice Chancellor Prof K Byrappa said: “It is our moral duty to honour the armed force personnel who dedicate their life for protecting our country.” As part of the programme, an exhibition of pre and post independent historical photographs, a collection by Dr Prashantha Naik (Associate Professor of Biosciences) was also arranged. Photographs of Jallianwala Bagh massacre, Lucknow Pact, Protest against Simon Commission, Indo-Pak partition, Round Table Conferences, Quit India Movement, Visits of Mahathma Gandhi and Nehru to Mangaluru, Swami Vivekananda’s speech in the Parliament of the World’s Religions, Constitution drafting committee, first Republic Day parade and many more photographs from 1885 to 1962 were also exhibited.